John Cho poses with a poster for the latest “Star Trek” film, during a press junket Monday in Beverly Hills. Taking on one of the most popular and iconic roles in science fiction history can be a rather daunting prospect, but John Cho said he’s had plenty of encouragement from the man who matters most. “He’s said, ‘You’re doing great,’ and that’s important,” Cho said of the support he has received from George Takei, the original Mr. Sulu from the “Star Trek” television series. “He’s a real pat-on-the-back kind of guy, which is a relief, because I desperately seek his approval,” Cho said. Cho, who has made his own indelible mark with roles in such films as the “Harold and Kumar” series, said he fully understands the importance as well as the fanaticism of lifelong Trekkies. He explained that since those fans are known for being extraordinarily familiar with the minutiae of “Trek,” he has to take care when discussing the films. 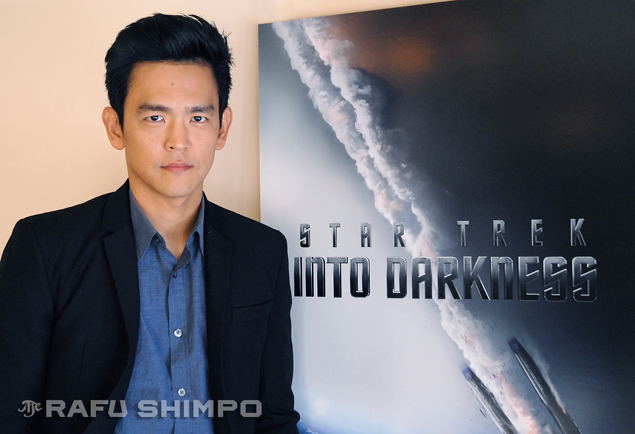 In “Star Trek: Into Darkness,” Cho again plays helmsman Hikaru Sulu, and at one point in the film, is made acting skipper of the legendary starship Enterprise. Settling into the captain’s chair – a feat that has been played infinite times in the imaginations of generations of fans – was a crowning moment for Cho.